It’s time for another SOS Challenge recipe hosted by Ricki at Diet, Dessert, and Dogs and Kim at Affairs of Living. This recipe is submitted to the SOS Kitchen Challenge for October. Sesame seeds are a fantastic choice for this month’s SOS Challenge ingredient. Sesame seeds are a powerhouse of nutrients and rightfully deserve to be an SOS featured ingredient! My sweet-tooth had a nifty recipe planned out before seasonal allergies hit and left me dizzy, headachy, and spending most of my time in bed with my eyes covered. A savory recipe came to mind while I was dozing in a Benadryl induced semi-coma. It would not only taste good but it would be very helpful to my queasy stomach. All the requisite ingredients were in the pantry and so began the experiment – in ve-ry slow stages. First, I soaked the dried beans that would be the base of the sauce. Our mothers prepared dried beans by soaking them overnight or longer. Then one day someone started doing a ‘quick-soak’ and beans have not been the same since then. Soak and rinse several times over the course of 24 hours to remove a number of unpleasant compounds and your beans will cook more evenly, be cleaner, save energy and taste better. For a complete explanation -> bean prep. Then I thought about the zatter spice mixture. My zatter was not especially fresh but the ingredients are so simple that I decided to make it up on the fly. Zatter is an ancient mixture that in its simplest form is toasted sesame seeds, thyme, and salt. 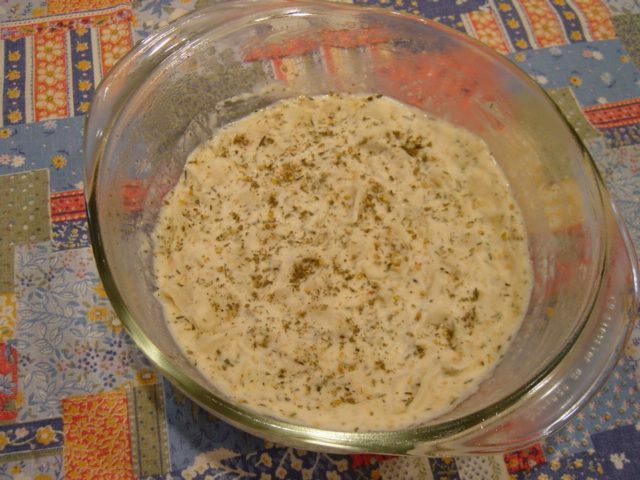 It is often mixed with olive oil, spread on pita bread and served with hot tea. So I pulled out the olive oil, sesame seeds (bought in bulk), thyme, and sea salt. I toasted the sesame seeds in olive oil over low heat after the beans were cooked and cooling. The beans went into the old faithful blender followed by the cooled sesame/oil mixture, sea salt, and thyme. The fragrance of the warm sesame seeds was validation enough for choosing to put it together this way. The resulting mixture was thick and rich with flavor. Part of my ‘delirious dream’ recipe was pasta! I had cooked up some Tinkyada brown rice shells while the bean/zatter mixture was in process. It was resting in an ovenproof dish and ready for the sauce. I had to add some water to thin the bean/zatter paste to sauce which had me thinking down the road to other uses for this tasty bean mixture – like a dip for veggies or as a sandwich spread. The result is tasty, nourishing, soothing and a very different spin on rice and beans! The beans should be well soaked and cooked until tender. Cook the pasta according to package directions until ‘al dente’ or softer if you prefer. Transfer the cooked, drained pasta to a baking dish. Measure the beans into the blender jar. 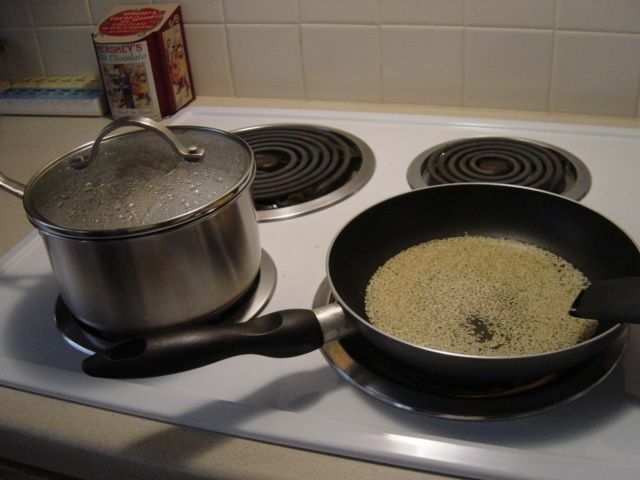 Pour the olive oil into a small skillet and add the sesame seeds. Cook over low heat stirring occasionally until the seeds look toasty and you can smell their savory goodness. Remove from the burner and allow it to cool for a bit so as to avoid a splattering hot oil incident. Then add the cooled sesame mixture to the blender jar. Measure the salt and thyme into the jar and process until smooth. You may need to add a bit of liquid if the mixture is too dry to process smoothly. Once the sauce is processed it can be stirred directly into the pasta. The pasta may have cooled somewhat by this time. The casserole can be stored in the fridge until needed or used immediately. It can be reheated in a microwave or conventional oven. This recipe makes about two grown-up servings.